Animal Kingdom Lodge and Animal Kingdom Villas have what I consider to be the best Activity Calendar of all Disney’s resorts. 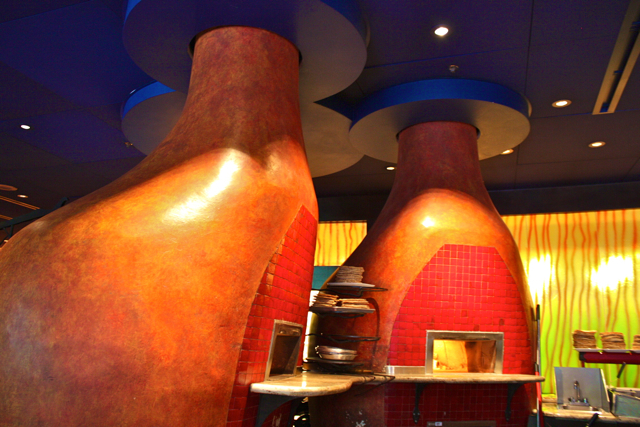 The Culinary Tour is just one of the many free activities available to guests, but is by far the most delicious. My tour group consisted of five other adults, several of whom had not yet dined at either restaurant. One of Boma’s Cultural Representatives greeted us at the restaurant podium right at 4pm. Cultural Representatives are Cast Members who’ve come from Africa to work at Walt Disney World for a year. The play a variety of roles at the resort, including working in the restaurants, serving as Savanna Guides or leading the many available resort activities. Our Boma Cultural Representative was a young woman from South Africa. She took us on a short tour of the dining area, explaining the story behind the decor. 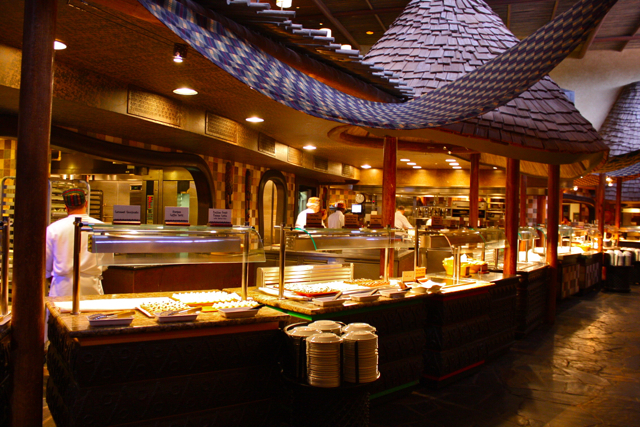 Boma is Swahili for “enclosure,” which is represented by the wooden walls used to section out the seating area and set the tone for the restaurant. Even though I had taken the tour before, I learned new things by taking it with a different Cultural Representative. To wrap up the Boma portion, we each received one of the famous Zebra Domes from the dessert station. 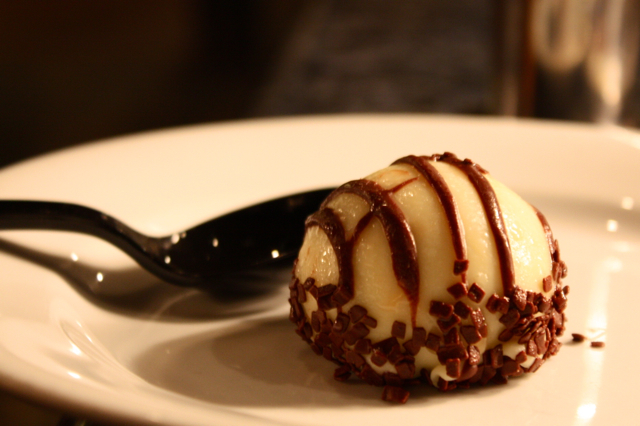 If you’re not familiar, Zebra Domes consist of an Amarula cream filling sitting on a thin chocolate cake base. It is coated in white chocolate ganache, the bottom covered in tiny chocolate squares, and the top striped with dark chocolate. Amarula, an African fruit liqueur, gives it a vauge alcoholic coffee taste. I’m not a fan of anything with liqueur, but they certainly have a cult following. Next, we met a Jiko Cultural Representative from Zimbabwe. 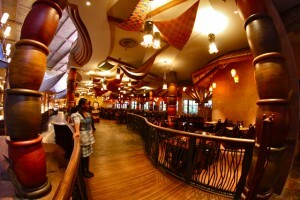 She gave us a quick tour of the bar and main dining area, pointing out a Hidden Mickeys as well as the tributes to African culture. The Jiko portion of the tour was considerably shorter because we did not spend anytime discussing the food options since guests can read a menu, unlike for the buffet-style Boma. Jiko, The Cooking Place, gets it’s name from the open view cooking area in the middle of the restaurant. Here, the six of us split two orders of the Tastes of Africa appetizer. 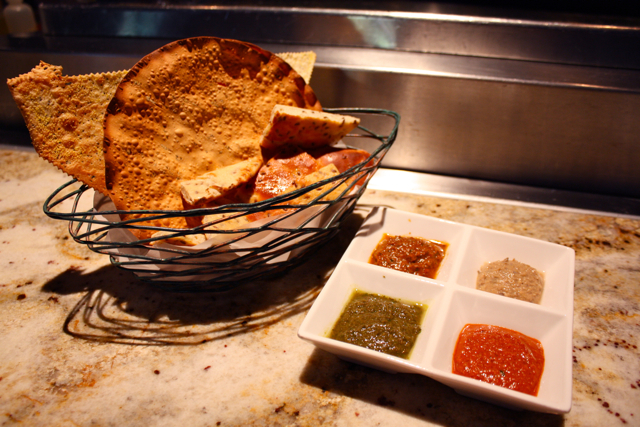 This consisted of a trio of breads (papadum, whole wheat lavosh & flaxseed naan) and four hummus-style spreads of varying spiciness. While we ate, the Cultural Representative answered guests’ questions about the restaurant and her experiences working so far from home. I never felt rushed, but we were all done by the time they started seating dinner guests at 4:30pm. Jiko is home to one of the largest Hidden Mickeys on property. All in all, I definitely recommend the Culinary Tour at Animal Kingdom Lodge. It is a great opportunity to add a low key activity your day. If you are staying elsewhere and looking to resort hop, I’d recommend paring the tour with an early meal at Jiko or Boma. If you don’t mind eating early, you could probably get away without having an Advanced Dining Reservation and waiting to pick your restaurant based on the tour. Both will normally have space available right when they open at 4:30pm. 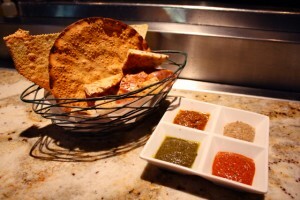 You can also check out The Mara, the resort’s quick service option which has a few unique flatbreads and African inspired dishes in addition to standard quick service fare. While you’re over at the Animal Kingdom Lodge, make sure to also check out the variety of African animals on the savannas outside the lobby. Savanna guides are out there most of the time to answer guests’ questions about the wildlife. Plus, if you linger long enough, they offer night vision animal viewing each evening at after dark past the pool on the far end of the resort. However, I would not recommend going out of your way for this tour – particularly if you are relying on Disney transportation. As fun as I thought it was, it is not worth dragging your kids out of the park and taking a bus over to taste soup. Your kids may very well enjoy the tour, but the only children I’ve seen on it had to be taken away after 10 minutes because they were bored. Like most tours, the Culinary Tour is best for folks who have been to Disney a lot and are looking for a new experience. For those guests staying at the Animal Kingdom Lodge or Animal Kingdom Villas, it is a good way to make the most of your visit. The Culinary Tour is currently offered at 4 p.m. daily. 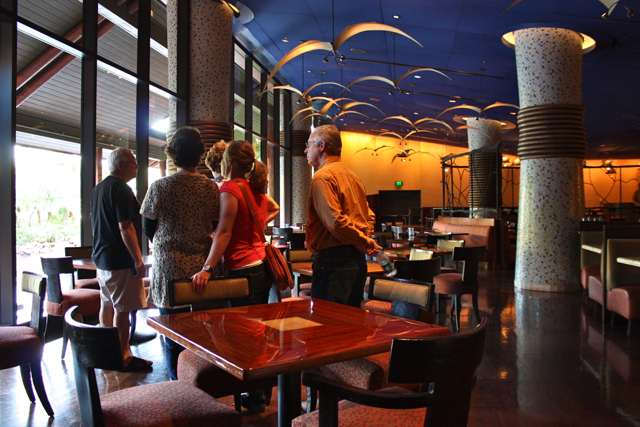 No reservations are accepted, and all you need to do to attend is show up at the Boma podium in Animal Kingdom Lodge. The tour is open to all ages and lasts 30 minutes. As resort activities can change monthly, check the Resort Activites Calendar or call (407) 938-3000 to confirm the tour schedule. 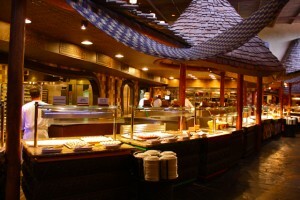 Have you tried the Animal Kingdom Lodge Culinary Tour? Do you plan on trying it out on your next trip? Let us know what you think! Lindsay DuBose is the foremost self-appointed Walt Disney World tour reviewer on the interwebs and a recent Orlando transplant. Another great review! I love this free tour series. I honestly didn’t know about these tours until recently. Thank you so much for the information. Keep them coming!! This is a great review of what seems to be a great tour! My parents don’t love the Disney parks, and I’m glad I have something at WDW to take them to. Would you recommend this tour or the Sanaa one? Depends on whether you’ve been to any of the restaurants yet or not. If not, try the AKL Culinary Tour first because you get to visit two of Disney’s most popular restaurants without having to devote a meal there. If you’ve already been to Jiko and Boma, try the Sanaa tour for a even more off-the-beaten path experience. I have stayed at AKL countless times & never done this tour. I will have to add it to our list of things to try. These two restaurants are in my top 5 at WDW it’s a great way to break up the day. This is such an awesome hidden gem. I’m going to try it out on my next trip. Jiko and Boma are two of my favorites on property, so it will be a treat to here some information about the background of the restaurants. Thanks for telling us about it, Lindsay! Had no idea the culinary tour was available and we always stay at AKL, and always eat at least one of the restaurants while there. Looking forward to having Boma in May, it’s the first time we’ve been there for dinner in years, usually opting for breakfast/brunch on a rest day. Thanks for opening my eyes to your Free Tour Series. This tour looks pleasantly interesting and educational. Really enjoyed this tour in Nov. Both restaurants are amazing! Did not know Sanaa offers one as well.